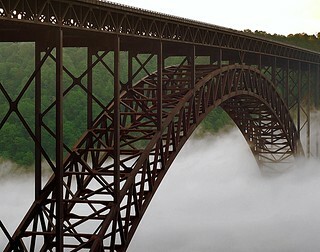 *The New River Gorge Bridge is a steel-arch bridge, in Fayetteville, West Virginia, United States. With a length of 3,030 feet (924 m), it was for many years the longest in the world of that type. Its arch extends 1,700 feet (518 m). Part of U.S. Highway 19, it is crossed by an average of 16,200 motor vehicles per day. Its construction marked the completion of Corridor L.
The New River Gorge Bridge carries U.S. Highway 19 over the New River at a height of 876 feet (267 m), making it the highest vehicular bridge in the Americas, and the second-highest in the world. Before the 2004 opening of the Millau Viaduct in France, it was the highest in the world.